Drilling mud from the Sabal Trail pipeline is leaking into the Withlacoochee River in Georgia. 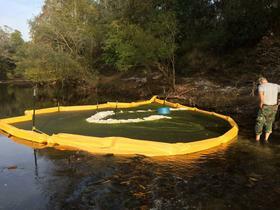 The spill in the Suwannee River tributary could impact the Floridan aquifer. Water activists are raising the alarm over a South Georgia drilling leak in the Withlacoochee River. Sabal Trail is drilling beneath the river to build a more than 500-mile natural gas pipeline stretching from Alabama to Florida. WWALS Watershed Coalition works to protect the Withlacoochee, Willacoochee, Alapaha, Little and Upper Suwannee Rivers. WWALS President John Quarterman says Sabal Trail assured the Florida Department of Environmental Protection last year the project was safe. The leak—stemming from a pilot hole drilled beneath the river—is relatively small. But Quarterman believes it could be a preview of future problems. Flows from the river feed the Floridan aquifer, and the pipeline project will run beneath the Suwannee and Santa Fe rivers as well. Shortly after this story was published a Sabal Trail spokeswoman provided comment via email. The company claims the spill was inadvertent, and "there was never any danger to human health or safety, and no harm to the environment." The spill involved drilling mud which Sabal Trail describes as primarily a mixture of bentonite clay and water. WWAL notes bentonite can reduce oxygen in the water potentially threatening fish and other aquatic species.